I love the month of May — and not only because it comes with nicer and more predictable weather where I live. I love it for reasons even better than that. I love it because, in a distinctive way, it traces the mysteries of our redemption. And it does this in a way that’s different from Lent or Advent or any other season. But Our Lady’s month always begins with a feast of Saint Joseph. May 1 is the great feast of St. Joseph the Worker. We set out, then, with not just our greatest saint — or even our two greatest saints — but with our awareness that they formed a family. 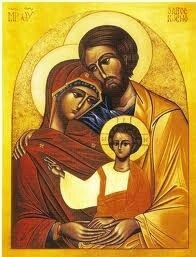 Mary and Joseph formed their Holy Family with Jesus, who is our Savior and theirs. They were a sojourning family — and a witnessing family. When Jesus was just a baby, Herod’s persecution sent them into hiding. They fled to faraway Egypt, where they remained till the despot’s timely demise. Mary and Joseph lived in a strange land — among the traditional enemies of their people — and they brought life and love with them. The Egyptians ever after could boast that they were the first to receive Jesus. Mary and Joseph were, in a root sense, apostles. The Greek word apostolos means “one who is sent,” and they — every bit as much as Peter and Paul — were aware that they went abroad on a divine mission. They were the icon of righteousness wherever they went. And the places where they went remain as pilgrim sites today. Tradition honors the Holy Family as “the earthly trinity” — a communion of love, with the eternal Son of God as its center. There’s a profound message in this. Salvation came to us by way of the family, because the family is the earthly image of God’s life in heaven. And that is the life Jesus saved us to share. We are not merely saved from our sins; we’re saved for sonship. We’re saved so that we can share the divine nature through our life in Jesus Christ. We’re saved in order to become fully alive in the Divine Family, the Heavenly Trinity. And that’s where the month of May leads us. This year it ends with two major feasts of the Church, on two consecutive Sundays: Pentecost Sunday and Trinity Sunday. So we celebrate the deepest mysteries of all: the giving of the Spirit, the birth of the Church, and the inner and eternal life of the Godhead. The family of Mary, the family of Joseph, the family of Jesus points us to the Family of God. With them this month, we sojourn not to Egypt and back, but to heaven — to stay. May is also a month of intense preparation for our Applied Biblical Studies Conference, July 22-24 at Franciscan University of Steubenville. I hope I’ll see you there. In the meantime, please pray for the success of the conference. I thank you in advance for that. And I thank you for all you do for the Saint Paul Center.